Jazz-lovers, listen up! 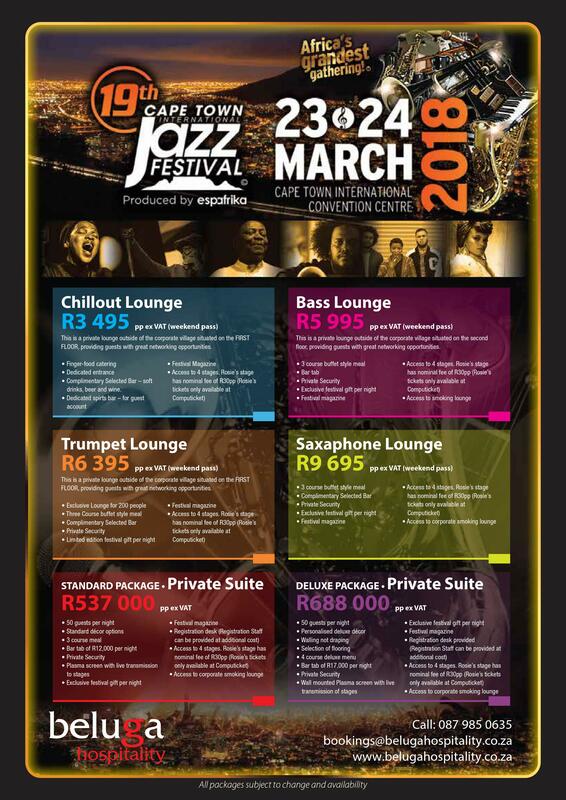 The 19th Cape Town International Jazz Festival is poised to take over the Cape Town International Convention Centre once again from the 23rd to the 24th of March 2018, with a jam-packed performance weekend. Next year, attendees can look forward to a line-up that includes everything from jazz legends and newcomers to musical storytellers and upbeat, high-energy acts for the young and the young at heart. Now in its 19th year, the much-loved annual music festival appeals to both jazz devotees and mainstream music lovers. Since its inception in 2000, the festival has seen its audiences grow exponentially and has successfully carved out a space for itself on the world’s event calendar, with fans from across the globe travelling to South African soil to attend. Don’t miss out on experiencing the magic of the Cape Town Festival. > Complimentary Selected Bar – soft drinks, beer and wine. FLOOR, providing guests with great networking opportunities. *This is a private lounge outside of the corporate village situated on the second floor, providing guests with great networking opportunities. *This is a private lounge outside of the corporate village situated on the FIRST FLOOR, providing guests with great networking opportunities.